Just about everyone has caught on to the fact that rental revenue can be a lifeline for struggling resorts, a source of prospects for resorts in sales, and an important tool for owner satisfaction when owners’ plans don’t allow for a vacation in a given year. In fact, the ARDA International Foundation’s State of the Vacation Timeshare Industry 2018 study reported rental revenues of $2.3 billion in 2017, with number of nights rented increasing to nearly 12 million. That’s up dramatically from the $1.6 billion the group reported for 2012 in an earlier version of the study. However, when these rentals are done through Online Travel Agency (OTA) sites such as Expedia and Hotels.com, commissions take a bite out of profits. To avoid those commissions, having a resort website that’s inviting, easy to use and offers competitive rates is a must, as well as a strategy to drive visitors to your site from search engines. That’s where e-commerce platforms come in. “Resorts can spend thousands of dollars building beautiful and stunning websites in hopes of attracting more visitors and driving more bookings,” says Steffan Berelowitz, vice president of Digital Platforms at Travel Tripper. “However, these websites often turn out to be digital brochures that are so disconnected from the booking engine that they cause inconveniences and fail to deliver satisfying results.” He compares the way many sites book accommodations to if Amazon simply showed pictures of items but you had to click to another area to find the price and purchase an item. TravelTripper, Switchfly, and other travel-oriented ecommerce platforms simplify the process of marketing rental inventory online, while also providing the ability to include ancillary products such as activities, airfare and car rentals. “We can do this all in a single transaction,” says Justin Steele, vice president of product at Switchfly. Both companies white-label websites for their clients, using resort or brand’s look and feel, logos and color palette. “We start by creating the website, always in your brand, then we determine the inventory you want to include, add all the connectivity, adjust the rules engine and how consumers are segmented,” Steele explains. For example, owners at your resorts could receive special pricing based on their membership tier. For developers with points programs, the sites can be configured to accept your club’s currency. They also offer digital advertising solutions with Google Ads and other sites. According to Berelowitz, Travel Tripper offers Real Time Ads (RTAs), an innovative new advertising technology that enhances advertisements by inserting real-time data about the hotel such as room scarcity, popularity, and price. RTAs helped a hotel achieve a 68 percent boost in conversion rates by enticing guests to click their ad over OTA ads. Switchfly can also offer your inventory on its network of sites, such as airlines and credit card issuers. By using an ecommerce platform, resorts keep customers for themselves, including their data. Berelowitz adds, “Then you can add them to your email marketing base.” Once the initial booking has been made, resorts can continue the relationship, offering activities and other ancillary products. Regulatory compliance, including privacy regulations, ADA requirements (see sidebar), and credit card (PCI) acceptance, are all included with the platforms. Robust reporting features are part of both ecommerce platforms, and their staff will help you determine the best metrics to focus on. According to a Feb. 17 article in the Wall Street Journal, the number of website-access lawsuits filed in federal court under the Americans with Disabilities Act reached 2,250 in 2018, almost three times the 814 filed in 2017. Among the problems that can affect people with visual disabilities are website features that can’t be properly translated by screen readers. Think photos that lack appropriate tags describing the images. For those with hearing issues, an audio alert must be accompanied by a visual cue. According to Nate Lane, senior director of Digital Platforms at Travel Tripper, resorts will want to ensure that their sites are compliant in two important ways. 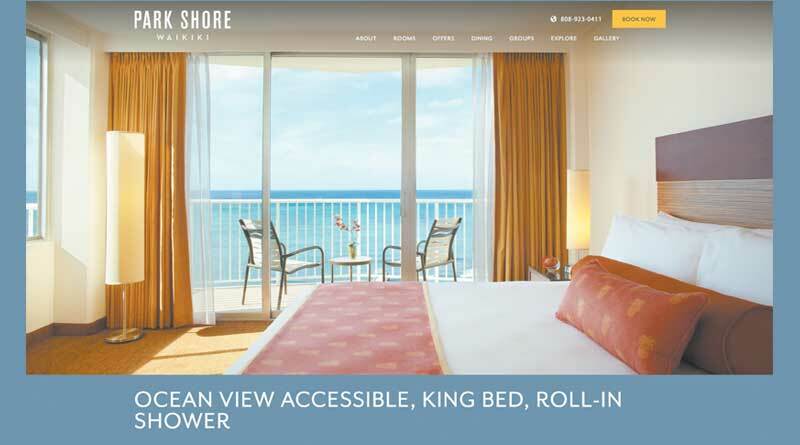 The first is the technical aspects, such as the image coding mentioned before, and the second is ensuring that the information travelers with disabilities need to book their rooms is accessible in the same way as information for everyone else. An ADA-compliant website also needs to meet certain technical criteria. Guests with visual or audio impairments use assistive tools and technologies to help navigate websites, so the code on your website and booking engine must support screen readers, keyboard navigation, color contrast/high-contrast modes, browser zoom and closed captions on video content.